November 21, 2015 by Erby Crofutt & filed under . 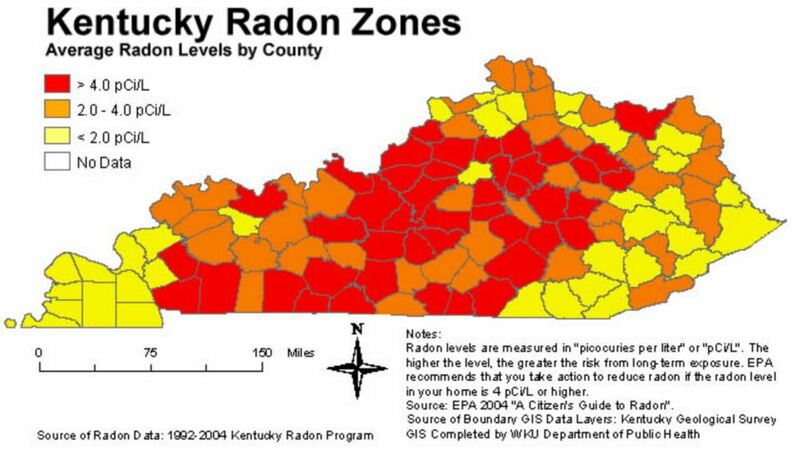 Due to Central & Northern Kentucky radon levels being high (see the Kentucky radon zone map at bottom of page), I provide independent Kentucky Radon Testing & Measurement Services. I do not perform Radon Mitigation installations. I have no stake in the outcome of the test. Buying a HUD/FHA home. View the HUD form (on the HUD website) that you must sign agreeing to be responsible for the cost of radon testing AND radon mitigation. They encourage you to do the testing because they know it’s a serious issue, but YOU must pay for it. The training and testing required for certification through the National Environmental Health Association’s (NEHA) ” National Radon Proficiency Program ” as a Residential Measurement Provider has been completed. This training and testing also qualifies for certification through the National Radon Safety Board. I was certified by NEHA. 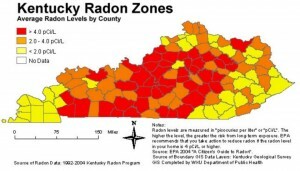 Radon Gas can be can be a serious problem, but is easily & economically fixed! Don’t be a statistic. Test and, if necessary, mitigate. 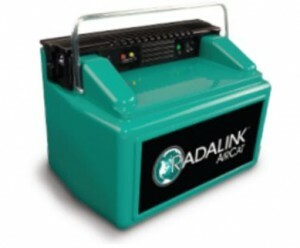 The inspector automatically transmits the collected data to Radalink’s central analysis facility via the internet. A complete, personalized test report is e-mailed to the inspector, the client, and other designated parties, such as the Real Estate Agents, and/or Seller, within the hour. There are no postponed closing dates because of delayed test results. NOTE: I do not perform radon mitigation. I don’t want the inherent conflict of interest in telling you that a problem exists and being the one to fix the problem. However, a high radon level is really no problem at all once a mitigation (radon reduction) system is installed. High radon levels are easily mitigated with the installation of a Radon Mitigation System. Although the cost may vary depending on the size and design of the home, it seldom costs more than $1,200 – $2.000 unless it’s a large home or has multiple foundation types. Radon mitigation systems not only work well in reducing radon concentrations by up to 99%, but also completely prevent damp soil air from entering the house which greatly improves indoor air quality as well. Very little maintenance is required. Operating costs are generally less than $10.00 a month for fan electricity and minor loss of conditioned air. Properly designing and installing a radon mitigation system is a professional level activity. This will insure the final system is properly located and sized to achieve optimal radon reduction and not cause any other potential issues with the structure. Only radon professionals should be hired to do radon mitigation. Be certain the individual hired visits the jobsite prior to beginning any work to give you a solid proposal for mitigation. Bids should not be made over the phone or by email. Be wary of inexpensive mitigation rates (less than $1,000). Price quotes promising really low installation rates are often too good to be true and leave the consumer with sub-standard workmanship and materials and a radon system that may not be working. Be sure to get a firm price and avoid hidden fees for future work when it may become necessary. Also, do not pay for the system in full before the work is complete. A valid radon test showing reduced levels should be obtained prior to full payment.